On the heels of wrapping up their fall tour, The Neighbourhood is sharing a new comprehensive project compiling their three EPs and third studio album, all of which arrived over the course of 2017 and 2018. A uniquely-conceived body of work, Hard To Imagine The Neighbourhood Ever Changing consummates an idea that was born long before September 2017’s HARD EP was released, bringing together selections from the four conceptually-bound projects to create a complete, living album that continually evolved over the past year and a half. The album features selected songs from all four previous releases (which have been replaced on streaming services by the new comprehensive album) and is available at all digital retailers via Columbia Records now. Listen HERE. Coinciding with the release, the band is also sharing a new video. The visual premiered via YouTube and includes a live chat comments section that will allow viewers and fans to engage with the band over the course of the video. The visual encapsulates the band’s two-year process crafting and recording their past four releases, offering a behind the scenes look at the work that went in to manifesting their idea of creating this dynamic album. Watch HERE. 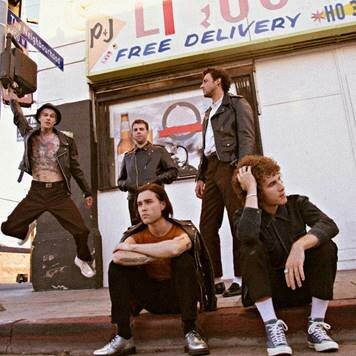 The Neighbourhood is also announcing a new run of European tour dates in support of the comprehensive project, launching next year. The band will play 10 dates across Europe launching January 30 with a show at London’s O2 Academy Brixton. The band will be supported once again by noise stalwarts HEALTH and master of infectiously downtrodden pop Yeek, continuing the band’s tradition of bringing compelling lineups across genre lines to their fans. Listen to Hard To Imagine The Neighbourhood Ever Changing HERE, and see below for tour routing and track listing.